They’re names. In case you’ve looked at the title of Helen Oyeyemi’s newest novel and wondered what the heck those three words might have in common, they are proper names of three of the main characters. Yes, “Boy” is a name. Of a woman. And also, in case you are wondering, even though one of the characters is named Snow, this is not a retelling of the tale of Snow White. Not really. Except that it kind of is. But just kind of. Well, actually it is, really. In a way. Welcome to the world of Helen Oyeyemi. 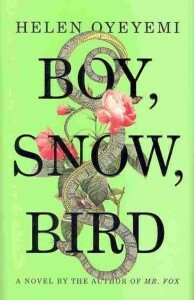 Set in the 1950s, Boy, Snow, Bird does indeed retain the elements of the Snow White fairy tale, but in a very real, very matter of fact setting. There is no Disney ethic lurking here. There is a youngster whose beauty lies in her fair skin, who captivates everyone with whom she comes in contact. She is loved, immediately, and she has an abstract goodness to her that is unsettling, otherworldly in a very set society. There is a stepmother, but there is also a very real question of if she is truly evil; she is not beautiful, nor resentful of others in their beauty. Given her background, it is a wonder that she is able to function as well as she does; others would have been forever victimized or maniacally tainted. She is neither. Furthermore, what this stepmother does to Snow is not done out of vanity; it is done out of a deep and honest love. There are no dwarves in this story, no Prince Charmings that ride in on white horses to lift curses by bestowing love’s true kiss (even though there is perhaps a yearning for one). Yes, there are mirrors, but they are of the mundane kind; the kind that may reflect the appearance of beauty but do not show the true image of the person who stands in front of them. 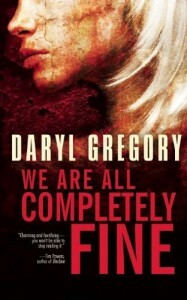 In fact, in this book, sometimes the characters cannot even see themselves in the mundane mirrors of the world, and when they do, the mirrors do not necessarily speak the truth while at other times they speak to a deeper truth than they convey. Does that mean there is no beauty? No, it does not. In Part One of Boy, Snow, Bird, we meet Boy Novak around the time she is 15. She lives with her father in the Lower East Side of Manhattan, her mother is absent and never spoken of (Boy sometimes muses that lack of a mother might suggest that she was a case of “spontaneous generation”). Her father is an old fashioned rat catcher by trade, and he is in high demand by the warehouses and factories “because he’s very conscientious about the clean up afterwards” – which means that Boy has grown up with cages full of rats in her basement, and she is surrounded by the certainty of death by trade. Her father also beats Boy, constantly. A couple of teachers asked me if I was applying to college, but I said: “Can’t afford it.” Actually, I was pretty sure that the rat catcher could, but I didn’t want to have that , or any, conversation with him. He hit me when one of his caged rats bit him. He hit me when I pronounced a word in a certain way that made him think I was acting stuck-up. (He told me that the difference between him and other people was that other people would only think about kicking me in the shins whenever I used a long word but he went ahead and took action.) He’d hit me when I didn’t flinch at the raising of his arm, and he’d hit me when I cowered. He hit me when Charlie Vacic came over to respectfully ask if he could take me to prom. I seem to recall he began that particular beating in a roundabout way, by walking up to me with a casserole dish and dropping it on my foot. There was almost a slapstick element to it all. I got a sudden notion that if I laughed or asked “Are you through?” he’d back off. But I didn’t try to laugh, for fear of coming in too early, or too late. As soon as Boy turns 20, she runs away. After stealing $20 from the rat catcher, she takes a convoluted route to a cross-town bus, then the subway to the Port Authority, and buys a ticket to as far away a place as she can afford, which turns out to be Flax Hill, Massachusetts – a town of specialists, a town where people make beautiful things for the sake of making beautiful things. Although Boy can’t “do anything”, and has no skills, she finds a cheap room in a boarding house, and begins a new life. She befriends another girl in the boarding house, Veronica Webster, who takes her on double dates, often with her unofficial steady date Ted, and his friend Arturo Whitman, a widower who has given up being a history professor at Boston University in order to make jewelry and who has a six year old daughter, Snow. She also meets Mia, a free spirit who is trying to establish herself as a journalist in that man-locked profession. Boy eventually finds a job at a bookstore where the proprietor, Mrs. Fletcher, sells antique books and first editions in the back room. Although she still carries an unrequited torch for Charlie Vacic, Boy’s relationship with Arturo moves forward and eventually they get married. It is when their child, Bird, is born, that the entire world is changed as long held family secrets come to light. And that is only part One. Author Oyeyemi’s writing is simple and imbued with magic, in style and slipped in as content. It’s a magic that often appears in a slightly eerie way, but feels natural and somewhat comfortable, which makes it especially dangerous. As with her earlier work, Mr. Fox, it is sometimes hard to tell if these instances of eeriness actually happen, or if their imagining is prescient to possibility, inevitability. The same holds true of her prose, the simplicity of which undercuts the largeness of the ideas being conveyed. Unlike Mr. Fox, however, her characters are flesh and blood, worldly wise, and not so much unlike what we could recognize in ourselves, in our pasts, if we held within ourselves so much akin to imagining. She invokes the power of the fairy tale in this novel, and it speaks all the more powerfully because it comes out as truth rather than hyperbolic romance or romantic moral. Another truth? Relationships are simple – the people behind them are not. I found Boy, Snow, Bird to be more accessible than Mr. Fox, and I was truly vested in its characters and the end game in which they find themselves. There are a few open plot points at the end of the book, but that feels right, as if, like life, there is no final resting point before the grave. After all, in Boy, Snow, Bird, it’s the telling of the tale that’s important – there’s no need for a happily ever after.